Turkey has repeatedly conveyed its "discomfort" to the U.S. officials over their plans to set up observation points in northern Syria, Turkish defense minister said on Saturday. Hulusi Akar said he told U.S. Chief of Staff Joseph Dunford and other U.S. officials during a recent visit to Canada on the sidelines of the Halifax International Security Forum on last Sunday that setting up the posts would have a very negative impact on perceptions of the United States in Turkey. "During our talks with both political and civilian interlocutors we repeatedly expressed our unease in various ways," he said. 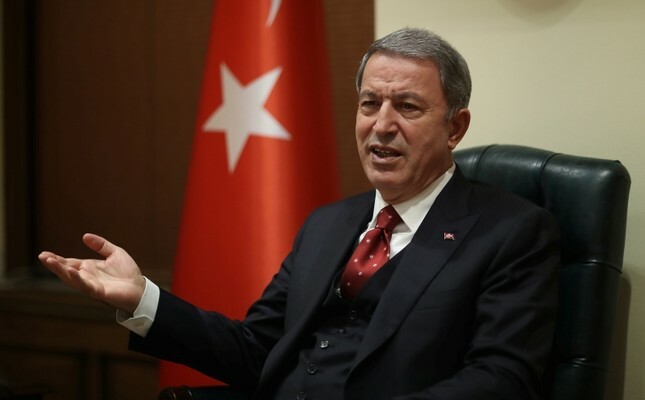 "I think actions like this will make the complicated situation in the region even more complicated," Akar told reporters after meeting with teachers on the occasion of national Teachers' Day. Turkey is angry at U.S. support for the People's Protection Forces (YPG), which it views as an extension of the PKK waging a decades-long terrorist campaign on Turkish soil. The PKK is designated a terrorist group by Turkey, the United States and the European Union. The YPG is the dominating group in the Syrian Democratic Forces (SDF), the main U.S. ally in Syria. "We have stated that the observation points to be established by the U.S. troops on the Syrian border will have a very negative impact […] and in the course of our discussions we expressed that it could lead to a perception that 'U.S. soldiers are somehow protecting terrorist YPG members and shield them'," he added. Defense Secretary Jim Mattis said on Wednesday the United States was setting up the posts to help keep the focus on clearing the final Daesh terrorist strongholds in Syria. The United States has long complained that tension between Turkey and the SDF has at times slowed progress on the fight against Daesh, which is still present in eastern Syria in a pocket east of the Euphrates River near the border with Iraq. President Donald Trump's administration hopes that the U.S.-backed fight against Daesh in its last foothold in northeastern Syria will end within months. But a top U.S. diplomat recently said American forces will remain to ensure the "enduring defeat" of the militant group.